How important do you think your tyres are? They are a crucial part of your vehicle’s safety and you shouldn’t neglect them. 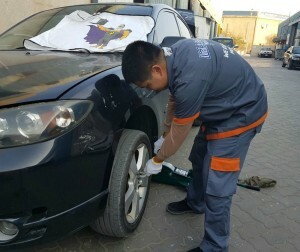 Statistics have shown that tyre failure is certainly the cause of many traffic accidents and road deaths in the UAE. But many of these crashes could be avoided if the following tips are implemented. Always examine your tyres regularly to know its condition. Remove stones or any other object embedded in the tread. Contact a tyre specialist in the case of lumps or bulges. Check the tyre pressure on a regular basis and not before a long trip. Always keep your tyres at the required pressure which is stated in your car owner’s manual. Correct pressures are needed for maximum safety, grip and good tyre life. Ensure your wheel alignment is in good shape as it can cause your tyres to wear easily. Always have the wheel alignment checked when installing new tyres. Do not mix tyres of different types on the same axle except in the case of temporary use of spare tyres. Before setting off on a car trip, certify your vehicle is in excellent conditions. You can do this by checking the overall conditions of your tyres. And to know the depths of your tyre treads, you can do the penny test for your car before commencing on a journey. It is not abnormal for the overall performance of your tyre to reduce over a period of time. Worn-out tyres will surely slow down the performance of your car. Sparing some time to know the condition of your tyres will go a long way in keeping you and your family safe. Good luck!